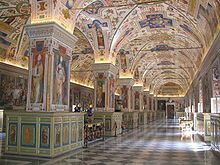 The Vatican Library is the library of the Holy See. Its official name is Vatican Apostolic Library (Bibliotheca Apostolica Vaticana). It was formally established in 1475. Its collections are very significant, it contains over 75,000 codices. There are over 150,000 manuscripts, and over 8,300 innucables. In total, there are over 2 million books and manuscripts. There is also a school for librarians, and a workshop to restore ancient tets and to create facsimile copies. This page was last changed on 15 May 2017, at 15:19.